Co-located, correlated AFM and Raman data acquisition can be accomplished in tip-scanning mode. This mode has many applications even though the spatial resolution of analysis is diffraction-limited for the optical part of the data. Semiconductors — The dataset depicted in figure 5 shows a semiconductor structure with partially buried silicon. The sample topography acquired by atomic force microscopy shows structures of different physical dimensions on the specimen but lacks chemical information. Chemical information is available in the Raman map on the right that is based on integration of the silicon peak at 520cm-1. The areas in red, yellow, and green are exposed silicon. Figure 5. 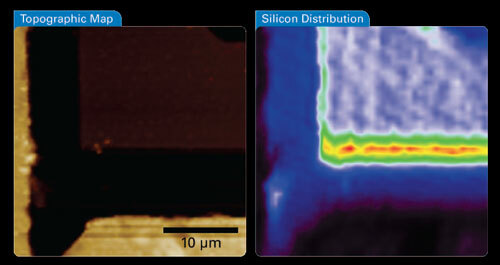 Simultaneous AFM-Raman acquisition sequence with (left) AFM sample topography, and (right) Raman map. The Raman image was created by plotting the intensity of the main silicon band at 520cm-1. The areas in red, yellow and green depict the areas of exposed silicon. Image size 30µm. Graphene — Atomic force microscopy and Raman are often used to study the material properties of graphene and carbon nanotubes.5 Here we show that the combination of quantitative nanomechanical measurements (QNM) and Raman spectroscopy can enable a better understanding of these materials. The intensity of the graphene G-band around 1580cm-1 and the shape of the 2D-band around 2700cm-1 can be used as a measure of the number of layers. The intensity of the D-band around 1350cm-1 indicates disorder of the lattice. Figure 6 shows AFM and Raman images of the G and D-band of a graphene flake prepared on silicon oxide. Correlations of the data unambiguously reveal the layered structure and the 300pm step height between subsequent layers. The D-band image also hints at an area of increased defects along the edge of the single portion of the sample. This area was subsequently investigated using the QNM capabilities of the AFM. 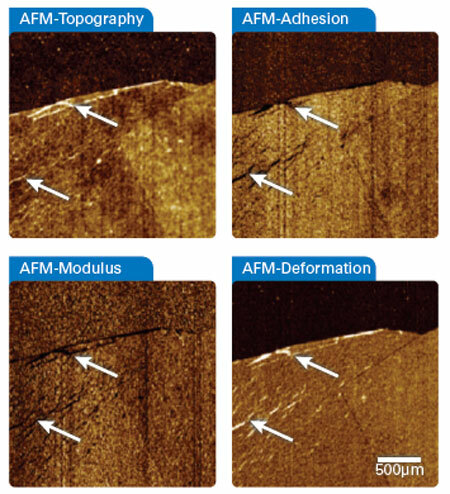 Figure 7 shows four channels (topography, adhesion, modulus, and deformation) of QNM data from a 2.5µm scan size. In the topographic map we can identify some wrinkle like structures. These structures exhibit softer compliance and reduced adhesion compared to the undisturbed portion of the layer). The deformation channel additionally shows a larger deformation on the graphene flake when compared to the substrate and lets us deduce that the graphene flake does not mechanically relax during the sub-millisecond contact time of the QNM measurement. Thus, the combination of co-located AFM and Raman data has allowed us not only to easily find and identify relevant features on the sample but also to further investigate their mechanical behavior in detail. Figure 7. Simultaneously recorded quantitative nanomechanical AFM data of a single and double layer of the graphene flake. The wrinkles marked by arrows visible in the topography (top left) are strongly reflected in the mechanical property channels as being softer (bottom left) with less adhesion (top right) than the surrounding material. The deformation channel (bottom right) points to a strong plastic deformation of the Graphene layers as they do not relax during the sub-millisecond contact time with the AFM probe. Image size 2.5µm. Figure 8 shows sets of Raman spectra taken at different heights of the tip above the sample. With the tip in feedback, the spectrum, shown in red, nicely displays the characteristic bands that let one identify the functional groups of malachite green. With the sample just pulled away 60nm, but the laser spot still focused onto the tip, it is evident that the TERS effect vanished and the spectrum, shown in black, is now purely generated by the far-field interaction. Figure 8. Tip-assisted Raman spectroscopy spectra of malachite green obtained using a gold tip illuminated by 633nm light at varying distances above the surface. The red spectra was obtained with the tip in feedback whereas the black spectrum was collected with the sample pulled 60nm away from the tip. By comparing the peak intensities with the tip approached to the retracted spectra, one can clearly see the striking enhancement of Raman modes. Both spectra were taken using the same integration time of 1 second. The ratio in intensity between the peak intensity in the near-field and far-field normalized to the different illumination areas is the TERS enhancement factor, and typically ranges from 104 to 108 depending on the combination of tip-sample used in a specific experiment.